At the same time, the nobility and upper classes commissioned artists to produce expensive packs of cards with which they enjoyed courtly games with social etiquette and also spent sums of money at gambling. Joannes, a brother in the monastery at Brefeld, wrote in 1377 that it is of advantage to noblemen and to others, especially if they practice it courteously and without money. Everybody played cards, from kings and dukes, clerics, friars and upper-class ladies to whores, sailors, explorers and prisoners in jail. Henry VII of England enjoyed gambling and his private expenses include several entries for money lost at cards. Likewise, Duke Wenceslas of Luxemburg and Duchess Joanna of Brabant repeatedly spent sums of money at cards. 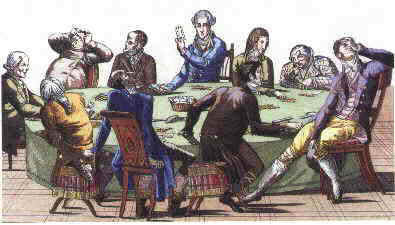 Above: card playing and gambling was a magnet for anti-social behaviour on account of the dishonest characters, card-sharps, cheats and scoundrels who frequented the less-reputable gaming houses. A whole underclass of confidence tricksters and professional swindlers were attracted to the gambling dens. 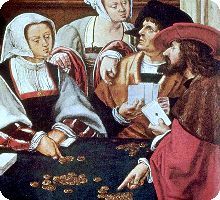 Most contemporary descriptions of card playing by Spaniards, Mexicans or Americans were generally couched in similar terms... gambling and card playing were dangerous and hence had a certain aura of forbidden pleasure and dreams of quick wealth. Successful gamblers are the stuff of legend. Seville was a favoured location by gamblers. Taverns, inns, gaming dens and brothels flourished along the banks of the Guadalquivir. The gaming house was the centre of a complex social system of occupations and functions, with its own hierarchy of master gamblers, card-sharps, money lenders and colluders, whose objective was to fleece any unfortunate fool. There were professionals and amateurs, specialised activities and a terminology of jargon to describe them. Gaming attracted a colourful underclass, a sort of inverted reflection of respectable society. The owner of the venue was assisted by a team of astute and shrewd stewards, sidekicks and racketeers who were informed in every aspect of card sharping and gambling tactics. Above: Spanish playing cards, woodcut & stencil, Seville, dated 1638 on the Ace of Cups. The Ace of Batons and the Two of Cups have small naked figures adorning the suit symbols. The Ace of Coins has a two-headed imperial eagle. Inscriptions on the cards read: "En S (en Sevilla) Con Licencia del Rey." These cards were discovered inside a wall during the demolishing of the former Granada prison, and were probably handled by gambling card players running a racket inside jail. Image of cards in the Fournier Museum, Alava, taken from: Agudo Ruiz, Juan de Dios: Los Naipes en España, Diputación Foral de Álava, 2000. Seville was also a major shipping port and the administrative headquarters for the New Indies. The lucrative Seville playing card monopoly at that time also included Granada and the Canary Isles read more →. 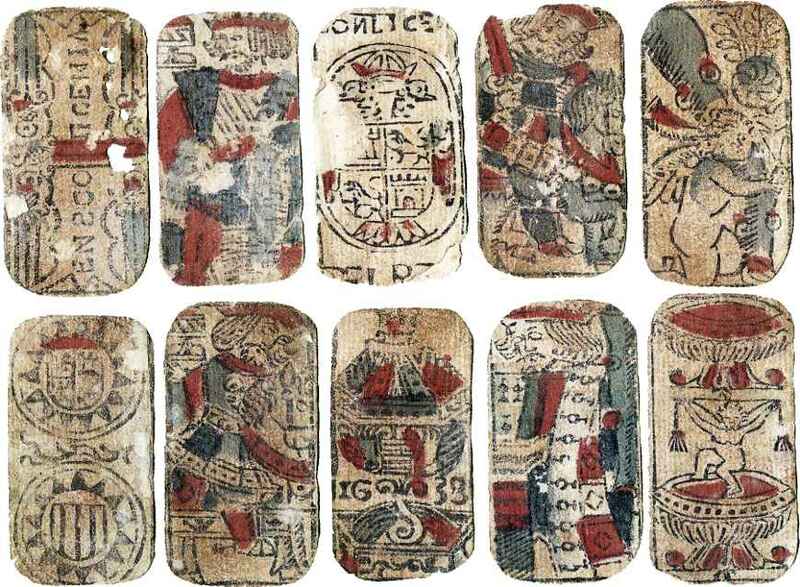 The Spaniards took their beloved playing cards and gambling habits to Italy and also to the New World when they explored Mexico and South America in search of gold. Studies show that though many people participate in gambling as a form of recreation or even as a means to gain an income, gambling, like any behaviour which involves variation in brain chemistry, can become psychologically addictive and harmful in some people. Reinforcement schedules may also make gamblers persist in gambling even after repeated losses. The Ten of Hearts. In February, 1773, at Brook's Club in London, Lord Lauderdale wagered £5,000 that if he was dealt a hand including the Ten of Hearts he would make a trick with it. Finally it appeared in his hand, he revoked, forfeited the trick and lost his bet. In 2009 the legal gambling market totalled $335 billion globally. Nearly two-thirds of that came from lotteries and casinos including online blackjack, poker and skill games. The other third was related to sportsbetting and wagering. Gambling in casinos is growing fast in East Asia, particularly Macau, the world’s biggest market. Online gambling is legal, taxed and regulated in Britain. Whereas American punters must rely on arcane payment systems and companies located offshore, British punters are safer. Companies have an incentive to keep minors from betting and to operate transparently. Elsewhere in Europe there are signs of market-opening—even in France, which has long protected its national racing and lottery monopolies. Chamorro Fernández, María Inés: Léxico del naipe del Siglo de Oro, Ediciones Trea, S.L., Gijón, 2005.